Help! 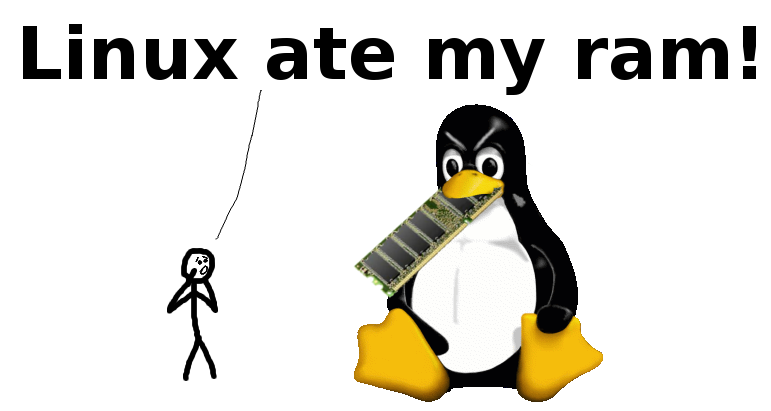 Linux ate my RAM! Linux is borrowing unused memory for disk caching. This makes it looks like you are low on memory, but you are not! Everything is fine! Disk caching makes the system much faster and more responsive! There are no downsides, except for confusing newbies. It does not take memory away from applications in any way, ever! What if I want to run more applications? If your applications want more memory, they just take back a chunk that the disk cache borrowed. Disk cache can always be given back to applications immediately! You are not low on ram! Do I need more swap? No, disk caching only borrows the ram that applications don't currently want. It will not use swap. If applications want more memory, they just take it back from the disk cache. They will not start swapping. How do I stop Linux from doing this? You can't disable disk caching. The only reason anyone ever wants to disable disk caching is because they think it takes memory away from their applications, which it doesn't! Disk cache makes applications load faster and run smoother, but it NEVER EVER takes memory away from them! Therefore, there's absolutely no reason to disable it! Why does top and free say all my ram is used if it isn't? This is just a difference in terminology. Both you and Linux agree that memory taken by applications is "used", while memory that isn't used for anything is "free". But how do you count memory that is currently used for something, but can still be made available to applications? This "something" is (roughly) what top and free calls "buffers" and "cached". Since your and Linux's terminology differs, you might think you are low on ram when you're not. How do I see how much free ram I really have? This is your answer in megabytes. If you just naively look at "used" and "free", you'll think your ram is 99% full when it's really just 47%! For a more detailed and technical description of what Linux counts as "available", see the commit that added the field. How can I verify these things? See this page for more details and how you can experiment with disk cache to show the effects described here. Few things make you appreciate disk caching more than measuring an order-of-magnitude speedup on your own hardware! LinuxAteMyRam.com was presented by VidarHolen.net. This site is available on GitHub for comments and PRs.